In the mid 1970s, the way car companies made headliners changed. Instead of the suspended style headliners, a foam backed cloth was laminated to a molded cardboard or fiberglass panel. This board is held in place by the surround moldings. Over time, from the sun beating on the roof, the foam backing begins to disintergrate, and thus the cloth lining begins to droop. This cloth cannot simply be glued back up because the backing has become powdery and so the cloth will not stick. If you’ve tried it, you know it turns into a mess. The only solution is to remove the board from the car, scrape off all the old foam and cloth, laminate new headliner material to the board, trim it, and reinstall the board. 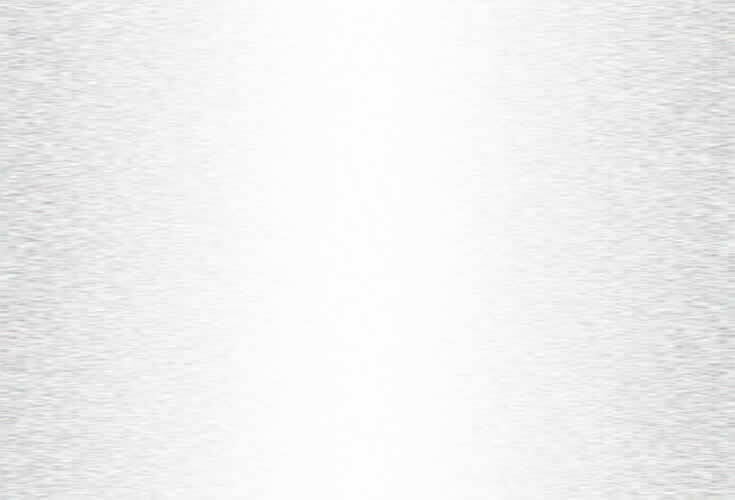 These represent the most common type of job. 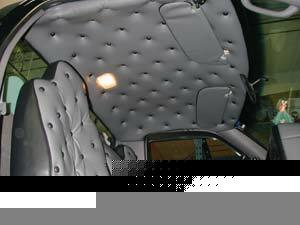 Luxury cars generally require more work as they may have thicker material, more attachments to the headliner, and fiberglass boards, which are more difficult to clean than cardboard panels. 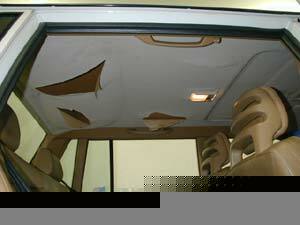 If the car has a popup glass sunroof, it is cut right into the headliner board. When replacing this type, we additionally cut and trim for the sunroof opening. Cars with electric sunroofs are different, in that for most models, the middle of the headliner board has been cut away. 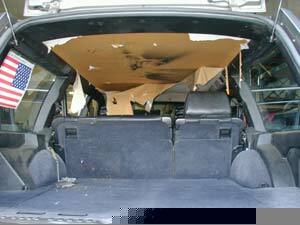 When replacing this type, we glue the material front and rear, and then stretch, glue and trim the material to the sunroof opening. 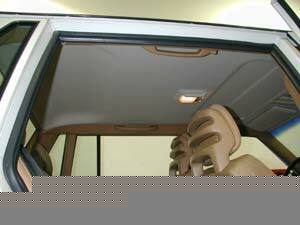 The sunshade panel is then covered as a separate unit. Cars such as Jaguars, Volvos and Saabs are exceptions, in that they do have full boards. 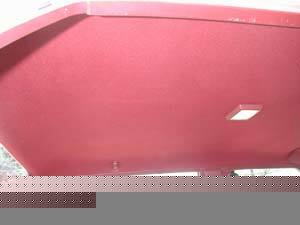 These headliners also require additional work, in that, the boards are often flimsy due to leakage. In addition, there is extra trimming and glueing involved to conform the material to the T-Top openings. Mid size wagon headliners are one piece elongated boards. Full size wagon headliners are comprised of two boards, one over the passenger seating area and the other over the cargo area. Redoing pick up truck headliners is similar to dedoing cars. Extended cab trucks simply have extended headliners. For some popular models which have no boards, replacement boards are available. SUV headliners vary widely. Older, full size trucks like Broncos and Blazers with removable rear shells have small boards over the front seats. Mid size trucks like the S-10 Blazers have one piece elongated headliners. Newer trucks like Tahoes and Suburbans have full length, complex headliners often with additional overhead consoles, vents, handles, etc. There are also many different types of van headliners. 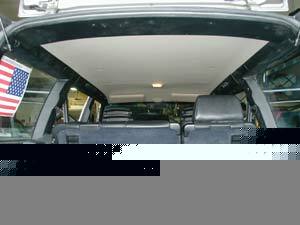 Mini vans usually have one piece elongated headliners sometimes with overhead consoles. Full size cargo vans, however usually have molded boards over the front seats, but bear metal over the entire cargo area. To cover this, we can either create separate flat boards, wrap them in headliner material and then screw them into position. 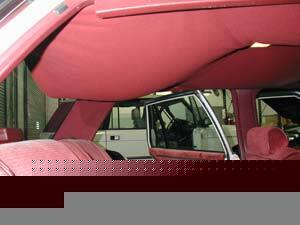 Or we can install a suspended bow style headliner by mounting clips and rods in place to support it. 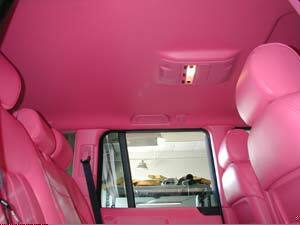 Conversion vans often have matching headliner material covering other areas such as side walls and trim moldings. Due to excessive family usage these areas often get beat up. All these areas can be recovered making the inside look new again.